The Royal Mint have released a new crown coin which is designed especially for Christmas time and holiday gift-giving. This is the first time a crown coin has ever been retailed featuring this festive time of year. This year’s Christmas coin celebrates the very heart of Yuletide traditions with an original Christmas-tree design — the perfect way to remember a wonderful time spent with family and friends. As each calendar window is pried open by eager hands, the big day gets closer and closer. It’s almost time to choose a tree, wrestle it through the front door, retrieve the decorations from the attic or basement, and begin the fun of wrapping the family’s tree in tinsel, string it with twinkling lights and shiny baubles hanging from every branch, and — as if by magic — the chilliest time of the year is transformed into the warmest. During the holiday season, many think of the three wise men bearing gifts of gold, frankincense, and myrrh — the three traditional offerings to baby Jesus born in the manger. During the holiday season, bags of chocolate coins symbolising treasure have been offered as small gifts. In this spirit and tradition, Christmas and coins go hand-in-hand. The new crown holiday coin is the perfect gift which will be remembered and saved as a treasured holiday keepsake. The new crown coin is designed by printmaker Edwina Ellis and includes a most familiar image: A typically decorated Christmas tree, capturing the excitement of the festive season through the stars. Baubles and candy canes adorn the branches of the tree — the centrepiece of any home at Christmas. 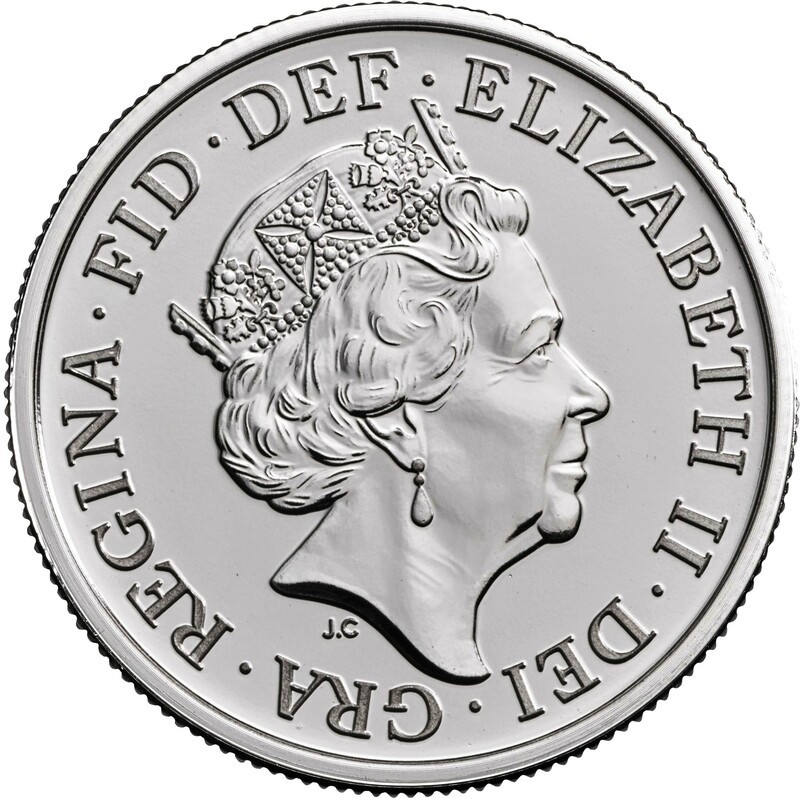 The obverse side includes the definitive fifth effigy of HM Queen Elizabeth II as designed by Royal Mint engraver Jody Clark and used on all circulation, collector, and commemorative coins since 2015. The coin’s denomination of 5 POUNDS is included on the legend around the Queen’s portrait. A legacy-denominated silver coin was also released by the Royal Mint in time for the festive holidays and gift-giving season — a new sixpence silver coin. This familiar coin of half a shilling was discontinued in 1971 when the United Kingdom adopted a decimal form of currency consisting of 100 pence to the pound. The traditional system of pounds, shillings, and pence (12 pence equal to 1 shilling and 20 shillings making up 1 pound) had been in place since the Tudor era, and as a result of the changeover, the old sixpence’s face (or equal) value became 2.5 new pence and was discontinued as a coin. In years gone by, and as part of this coin’s tradition, a sixpence was included in a Christmas pudding, and the one who finds the coin in their serving has good luck for the coming year — not to mention the princely sum of sixpence to spend. The last, or fourth, Sunday before Advent in the Anglican Church calendar (which falls between the 30th October and 5th November inclusive) is also remembered as “Stir-up Sunday.” This is the traditional day to get stirring and baking, and when the little silver coin is dropped into the mixing bowl, this is the time to make a wish and look out for a very special addition after Christmas dinner on the big day. The coin is produced according to its former specifications to be an updated design of this legacy coin, were it still in circulation. Designed by John Bergdahl, the reverse depicts the Queen’s cypher of E II R surrounded by a garland. The year of issue, 2017, is divided in half and placed on each side of the crown. 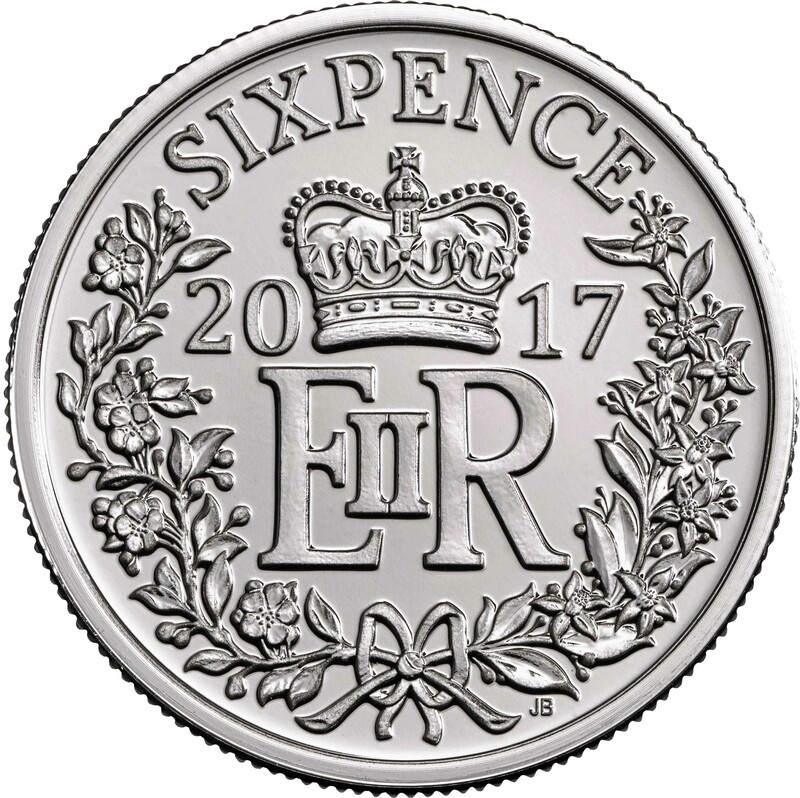 The denomination of SIX PENCE is placed above the primary design. 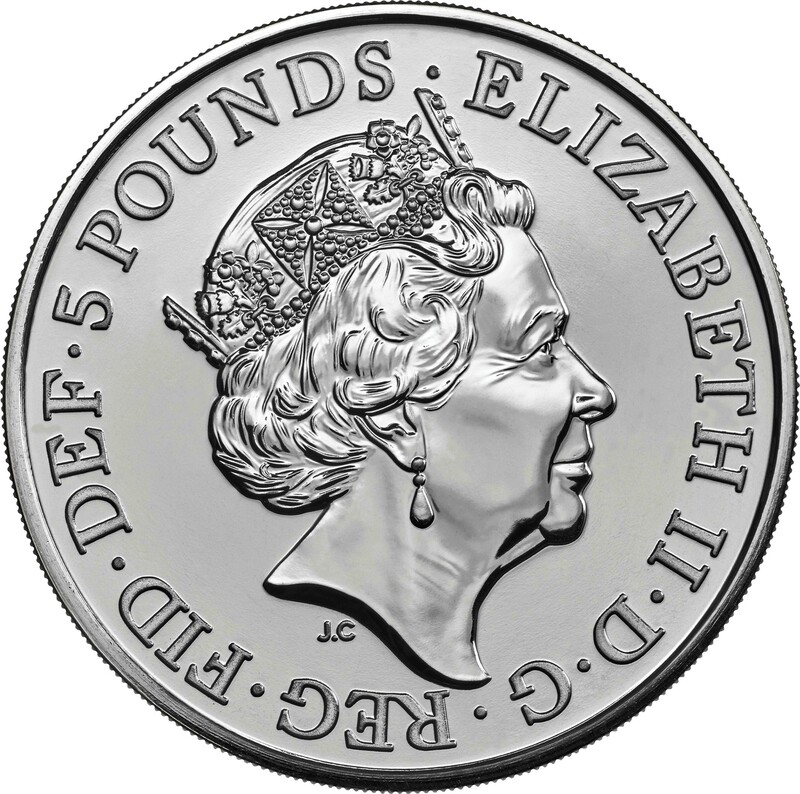 The obverse side includes the definitive fifth effigy of HM Queen Elizabeth II as designed by Royal Mint engraver Jody Clark and has been used on all circulation, collector, and commemorative coins since 2015. 3.35 g 19.4 mm Brilliant Unc. 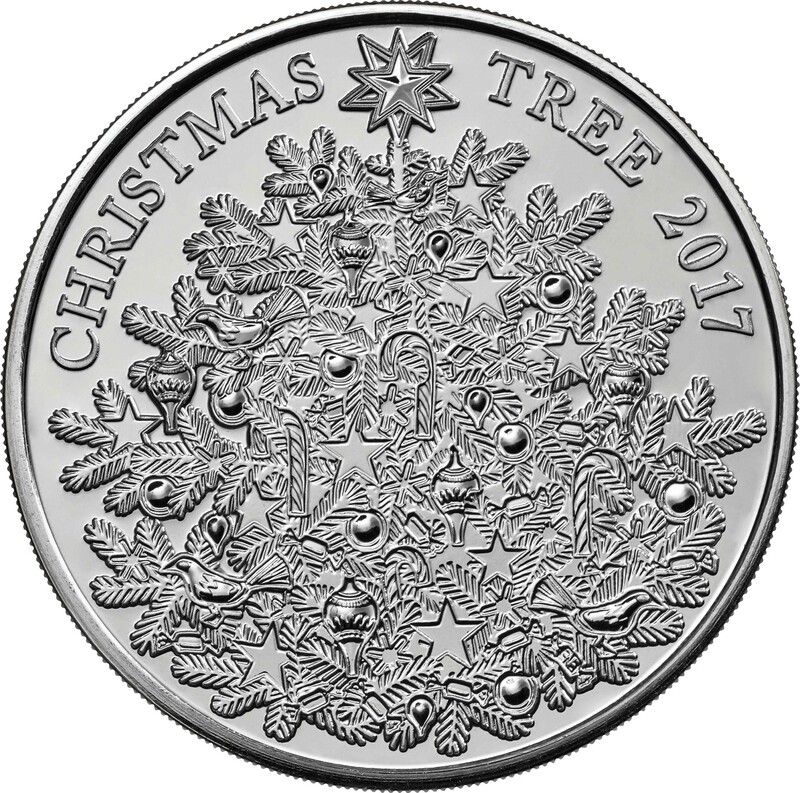 This 2017-dated crown coin is struck only in cupro-nickel, possesses a Brilliant Uncirculated finish, and is presented in a practical and festive Christmas-card format. 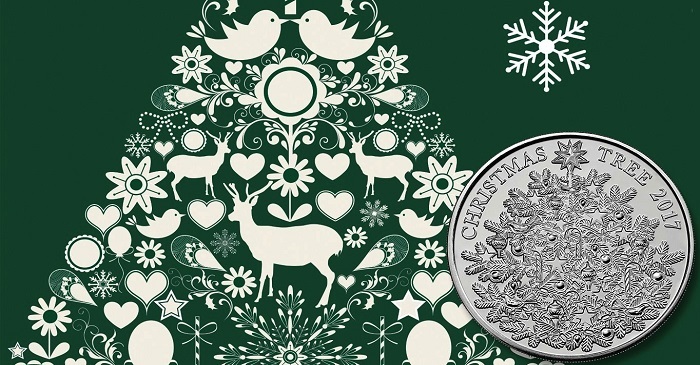 The Christmas sixpence coin is struck in sterling silver and minted in Brilliant Uncirculated quality as well. The latter coin is presented in a colourful folder featuring a Christmas pudding on the cover — a festive reminder of the coin’s Yuletide tradition with many families. For more information on this and other coins offered by the Royal Mint, please visit their website.